^ 18. 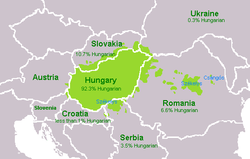 Demographic data – Hungarian Central Statistical Office and calculation at Hungarian people(Number of Hungarians in Hungary). ^ 2002 Romanian census Archived 2009年3月2日, at the Wayback Machine. ^ National composition of population Archived 2007年7月6日, at the Wayback Machine. ^ Položaj Nacionalnih Manjina U Republici Hrvatskoj - Zakonodavstvo I Praska Archived 2007年5月16日, at the Wayback Machine. ^ Bund Ungarischer Organisationen in Deutschland Archived 2006年2月6日, at the Wayback Machine. ^ Revista Época Edição 214 24 June 2002 Archived 2013年7月3日, at the Wayback Machine. ^ Hungarian Embassy in Buenos Aires 20 June 2009 Archived 2009年2月1日, at the Wayback Machine. ^ Ornella Semino et al 2000, The Genetic Legacy of Paleolithic Homo sapiens sapiens in Extant Europeans: A Y Chromosome Perspective.